Valentine's day is hands down my favorite holiday of the year. For me it's not about romance or fancy gifts, but rather spreading some sweetness and reminding my friends how much I care about them -- a tradition I highly recommend. Each year, I come up with one striking gift that I can make or buy in multiples and wrap assembly line-style. Often it involves candy (I have a sweet tooth). But this year, I'm creating a "Sweet Dreams" care package with a pair of super-soft flannel pillowcases, a quilted-satin eye mask, and a compilation of lullabies. It's all wrapped up in a giant satin bow with a sparkly stick-on heart. What could be lovelier than the gift of good sleep? A good first impression, that ta-da moment, is a key part of making Valentine's Day fun. And my huge bejeweled bow is nothing if not bold. Bright pink and extra wide, it's also all the wrapping this gift requires. Luxury Flannel pillowcases, in Snow White and Pearl, $60 for 2, by Martha Stewart Collection, from macys.com. Eye mask, $25, themonogramstudio.com. Pride satin ribbon, 144 mm wide, in Watermelon, $16 per yd., mastertrokecanada.com. Rhinestone heart applique, $20, mjtrim.com. Kevin's valentines are always pretty -- and memorable. Here are three past favorites. It was just too silly to pass up! 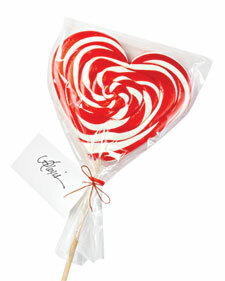 What adult expects to get a great big red-and-white-swirl heart-shaped lollipop? Plus, I love just about anything wrapped in cellophane. Its crinkly sound instantly conveys festivity. For each recipient, I wrote a note on a plain white card tied to the lollipop with waxed red twine, and that was it. Heart lollipop, $15, papabubbleny.com. Who doesn't adore a little box of chocolates? Any one of these hearts makes a perfect valentine for anyone. They're so easy and elegant, I've given them several years in a row. The tins might be the best part; they're great on a desk for glamming up paper clips, loose change, and even other candies. 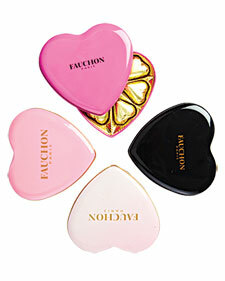 Fauchon chocolates in magenta tin, $22.50 for 7 pieces, tasteofparis.us. One year I treated some office pals to small phalaenopsis orchids. Their size was ideal for cluttered desks. 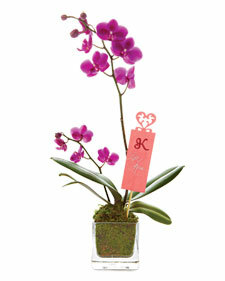 I added a frilly card signed with a glittered K. Mini phalaenopsis orchid, available at nurseries or florists. Lattice Heart Deep Edge punch, $18, and large pink glitter alphabet sticker, $5 for 3 sheets, by Martha Stewart Crafts, from michaels.com.